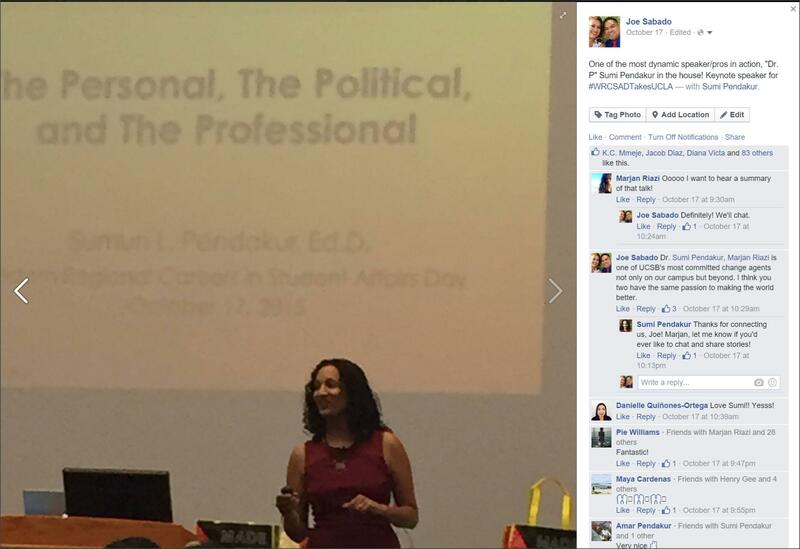 Dr. Sumun (Sumi) Pendakur‘s keynote speech (“The Personal, The Political, and The Professional”). Dr. Pendakur delivered a dynamic speech about the intersections of her personal upbringing and her profession. As she said, “we all come from somewhere” and so she spent some time introducing her parents, specifically her dad, and how their experiences informed and shaped her world views and her activism. She shared her personal story because as she said, “personal narrative informs our work we do.” She spoke about our obligations as student affairs professionals in serving all students and to promote success for all students, not just for some. She asked the question “are they graduating and thriving or are they surviving”? Dr. Pendakur also shared some strategies to get the most out of this conference and they are applicable to our daily work as well. For one, she suggests doing some relationship building – purposeful networking. In addition, she suggested self care/renewal. Conferences this size can be a challenge for introverts (like me) and it’s okay to find a corner some place alone to re-energize ourselves on our own. Lastly, she suggested pushing the edge / practice taking risks. Ask questions and challenge. We need to practice asking questions and we don’t have to be SSAOs to be asking questions. We can ask questions wherever we sit in the institution. Reflections from Senior Affairs Officers. Four seasoned administrators (Dr. Jeff Klaus from CSU Long Beach, Dr. Sumun Pendakur from Harvey Mudd College, Dr. Suzanne Seplow from UCLA, and VP Henry Gee, Rio Hondo Community College) along with the facilitator Dr. Mink-Salas from Azusa Pacific University shared some really valuable insights on their experiences and they also shared important lessons. 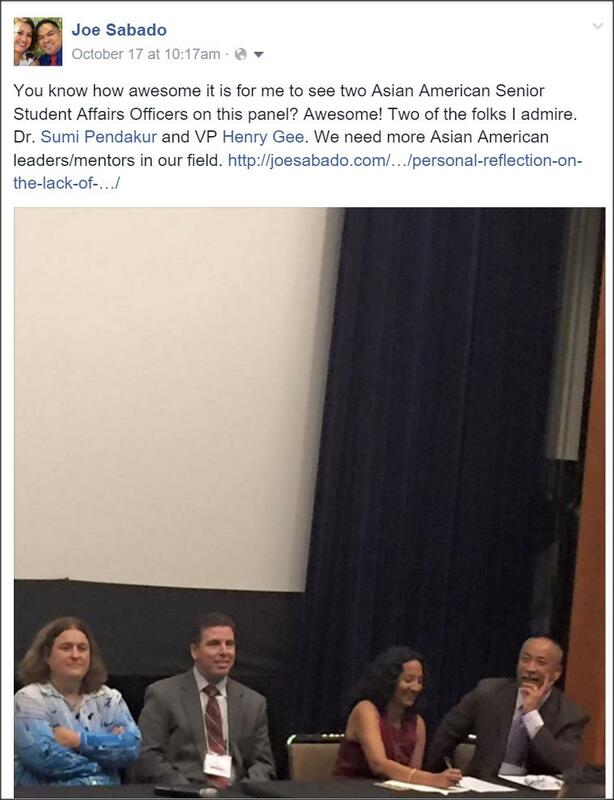 Personally, watching two Asian American senior administrators on the panel was a welcome sight. 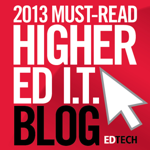 As I wrote on this blog post, we need more Asian American mentors/advocates in higher education. The messages from all of the panelists were all valuable but the messages from VP Henry Gee and Dr. Pendakur spoke to me as an Asian American. This session really made me think of where I am in my career and where I would like to go in my career. It was during this session when I had this “Eureka” moment of what my purpose in student affairs has been though I never realized what it was. 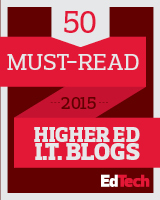 This was to shape my institution and higher ed in general to best serve the interest of students! The other important insight I got from this session was the idea that I don’t want to be pigeonholed as an “IT guy” because I’ve primarily been in student affairs IT for most of my career. I have always seen myself as student affairs professional who works primarily with technologies to promote student success and also one who has played several roles as an organizational advisor, mentor, FYE discussion leader, multicultural programming facilitators, etc. 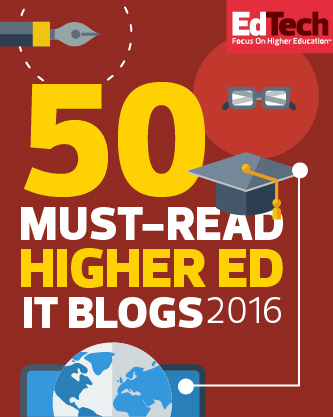 The challenge and interest for me has been on how to bridge the gap between IT and student affairs and in general, how to use technology more effectively within the context of student affairs. It is still my goal to be in a senior administrator someday to be able to solve the challenge I posed through a position of Dean of Student Affairs Technology, a role that does not yet exist. This role needs to be at the highest level in student affairs organizations sitting along side other senior student affairs officers (SSAO) table. As this role still does not exist, I continue to advocate that an IT director or one who is in charge of enterprise technology initiatives within student affairs need to be at the SSAO table. Social Media in Student Affairs session. I sat on a panel with VP Henry Gee and Jennifer Rodil with Grace Bagunu as the moderator. We spoke about the role of social media at the personal, campus, and professional organization levels. As VP Gee shared, Grace was the first social media account manager for NASPA Region 6, and she was instrumental in getting VP Gee to use social media. Jennifer also credited Grace as her social media mentor. I personally met my co-presenters through social media first and have become friends since we met and so this session was a fun one to be a part of. VP Gee spoke about why he joined Twitter at the urging of Grace and why he joined Facebook (to listen to feedback about his programs). He also provided important responses to questions from the audience on how to appropriately use social media as it relates to job searching and networking. 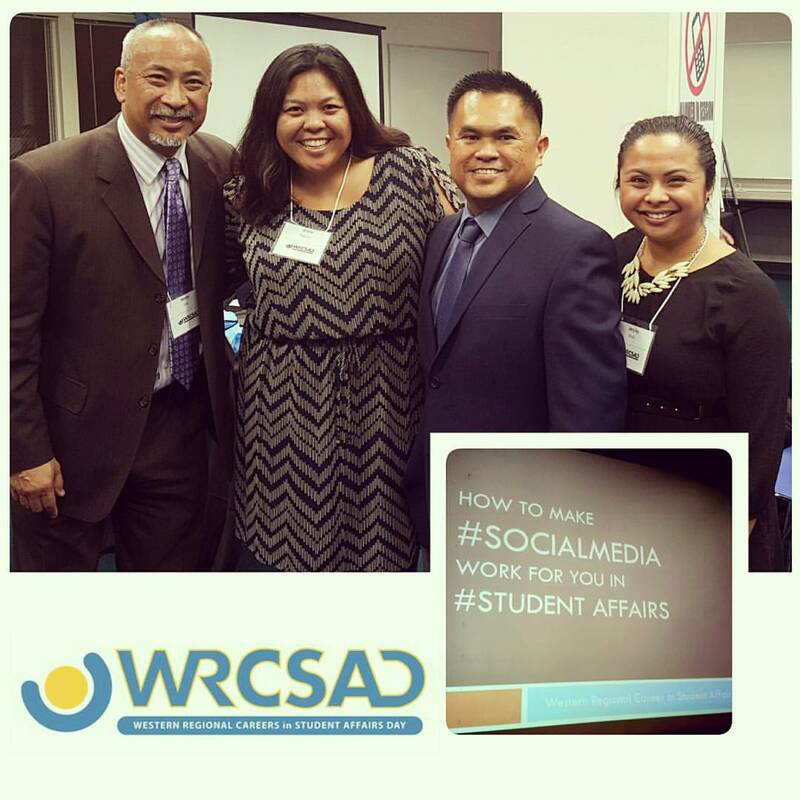 Jennifer provided her insight on how she manages her department’s social media presence as well as strategies on promoting engagement with the NASPA Region 6 twitter account as well as the Instagram account. A question was asked by an audience member on how to effectively manage time spent on posting contents and managing social media accounts. Jennifer suggested having a schedule of postings and along with the schedule are the types of contents to post. I spoke about specific uses of social media at UCSB. I cited how I used facebook to share information about the status of our IT services during the power outage since our email server was out of service. Since we couldn’t send messages through our email server, facebook became the primary medium to communicate with our UCSB customers about the statuses of our services until we were able to have email service up and running again. The second example I provided was the significance of social media during a crisis. I specifically spoke about the tragic Isla Vista shooting on Mary 23rd, 2014. Social media became the medium for real-time communication (I learned about the shooting the minute shots were fired from students I advise through their facebook statuses), community building (show of support within the local UCSB community and across the globe on social media), and event coordination (series of events were held that following week along with a memorial at UCSB’s Harder Stadium attended by 20,000+). I also spoke about the reasons why I blog including why I started (I was frustrated because I had a lot of ideas but I didn’t feel heard at my campus so my blog became a platform for me to express my ideas), what my purpose for blogging (promote student affairs technology and leadership), some strategies and tools I use, as well as how I address the common challenge of how to write authentically (I don’t share everything but what I do share are true to my heart). Some audience members also shared their success stories including how they used social media on campus. One of the stories shared by the creator of the account was the use of twitter to inform students of food on the UCLA campus. The twitter account is called @hungry_bruin. Several attendees spoke to the panel after the session for several minutes thanking us and to exchange other ideas. The three sessions I attended were informative and they led me to reflect on my role as a student affairs professional and how I view my role at my university as well as my career path. In addition to the value provided by the sessions, the most valuable experiences I got out of the conferences came during the breaks and lunch. These were the times when I had the chance to connect with our NUFP fellows and mentors but also to re-connect with friends I have not seen in a while as well as to meet new ones. Attending this conference with my fellow and our NUFP team was a wonderful experience we could build upon to further develop our relationships and to learn more about each other. 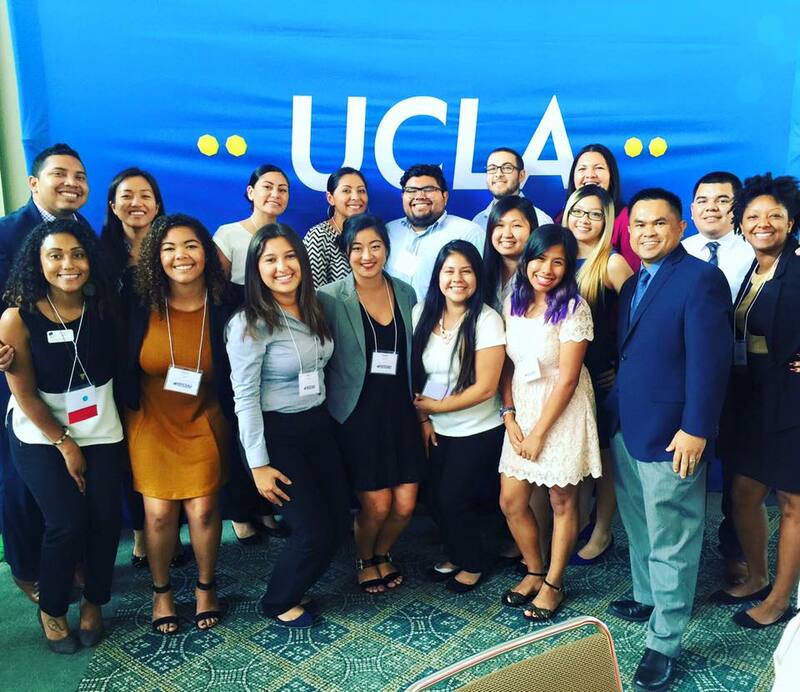 UCSB NUFP Team (photo courtesy of Klint Jaramillo). The conference was also an opportunity to connect with other Filipin@-Americans in student affairs. We started this tradition of taking a group photo at conferences starting last year and this photo below is a part of that tradition. 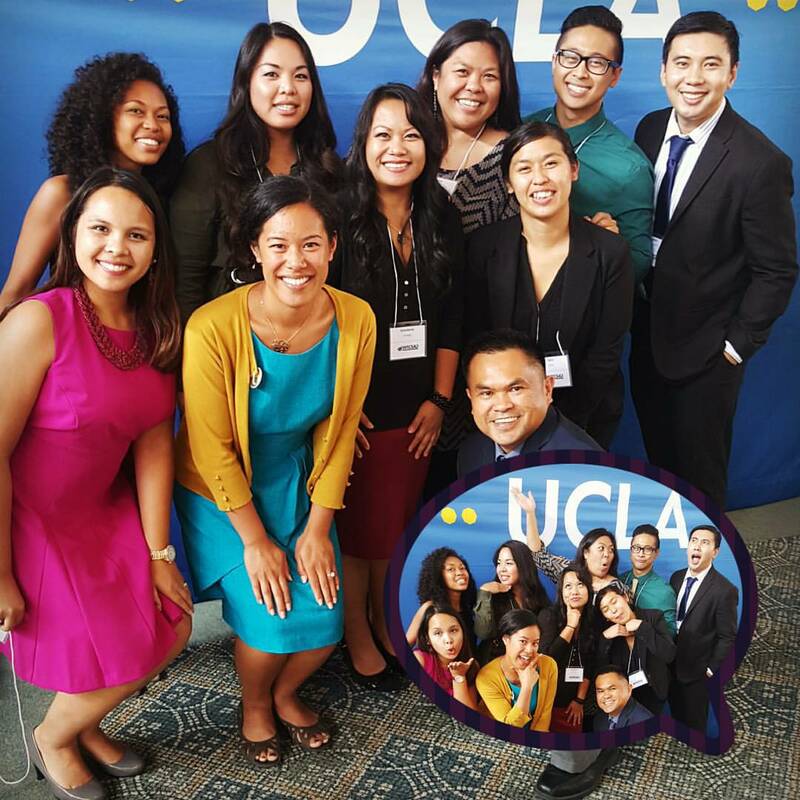 It was nice finally meeting other Fil-Am professionals I met via social media face to face for the first time.